For applicants to MFA and Ph.D. programs in creative writing, 2018 is at once the best of times and the worst of times. It’s the best of times because there are more such programs than ever before—so there’s likely a quality program nearby, wherever you live—and because more MFA and Ph.D. programs in creative writing are fully funded for all students than ever before. That means there’s no longer any reason for applicants who can’t attend a graduate creative writing program without full funding to apply to any program without that feature. Today’s applicants to graduate creative writing programs also benefit from the volume of hard data research on creative writing in America that’s been conducted over the past decade; whereas applicants who sought a creative writing MFA or Ph.D. during the first “boom” in these programs at the end of the 1980s had little information to work with other than hinky “reputation rankings” developed by a small group of creative writing professors, today’s applicants can find reliable information on program acceptance rates, funding packages, student-faculty ratios, postgraduate job and fellowship placement rates, and much more. And because in 2018 there are sizeable applicant communities congregating on Facebook and elsewhere, more than ever before a graduate-school creative writing applicant needn’t go through the arduous process of applying to creative writing MFA or Ph.D. programs alone. Online applicant communities provide not only emotional support to anxious applicants but also an opportunity to get information from alumni and current students at scores of new and established programs. Finally, because innovative multi-genre low-residency programs and “specialized” full-residency programs—programs with a theme or curricular emphasis—are now rapidly growing in number, applicants unable to leave their jobs or who have either a very broad or very narrow focus as writers are better able than before to find a program that meets their idiosyncratic needs. Yet for all the good news above, there’s also a dark cloud over creative writing in 2018—and it’s not clear yet whether it will be temporary or permanent. More than ever before, aspiring creative writers are wondering, not without good reason, whether conventional “workshop” pedagogy—which has remained largely unchanged for 130 years—is actually more conducive to enhancing one’s abilities as a creative writer than other, more innovative methods. The conventional creative writing workshop proceeds deductively from a series of first presumptions about creative writing that you may or may not share: for instance, it does little to reward formal complexity, idiosyncratic ingenuity, or the attention to performance that can lift poetry and prose off the printed page for large audiences; it forces a cone of silence upon poets and prose-writers before, during, and after they are workshopped, preventing them from dialoging with their peers about their unique ambitions and perspectives; it does too little to focus students’ attention not just on what we write but why we write, and for whom, and from which deeply personal connections to genre, self-identity, culture, and language. While none of these deficits in the workshop method are new, what is new is the healthy skepticism about writing pedagogy that young writers of poetry and prose are bringing to their undergraduate and graduate classrooms. Why is hybrid, cross-genre, multi-genre, multimedia, transmedia, mixed media, interdisciplinary, “slam,” “flash,” “genre,” “fan-fic,” high-concept, post-postmodern, collaborative, and/or formally experimental writing so difficult to profitably bring into a workshop setting (or in some instances explicitly disallowed)? Why do we approach writing pedagogy deductively, via the study of aesthetics, rather than inductively, via the study of poetics? Why do most workshops offer no formalized training in how to perform a literary artwork as well as compose it? Why are students ostensibly encouraged to workshop writing that is unpolished and adventurous, but implicitly pushed—by the tone, tenor, and format of conventional workshopping—to impress their classmates with already publishable work? Are we really comfortable with the often gendered master-trainee relationships that tend to dominate contemporary creative writing instruction? Why has the workshop format not been seriously amended or augmented in the century-plus since it was invented? Is it that invulnerable to perfection, improvement, cooption, or replacement? These and other urgent questions lead to a far broader one: has creative writing done enough to carry itself forward into the twenty-first century—the digital age—or is it a twentieth century, pre-internet discipline profiting from under-coverage in the media of its longstanding disciplinary malaise? I wrote The Insider’s Guide to Graduate Degrees in Creative Writing because today’s applicants deserve to know how good they have it and to be able to see the hard data undergirding the wealth of new opportunities they enjoy. But I also wrote it because applicants deserve to know that creative writing is a discipline in transition, and the contours of this transitional phase suggest that—at least for the time being—an MFA or Ph.D. in creative writing may not be the right choice for a large number of aspiring poets and prose-writers. These latter truths are the ones you won’t often hear from creative writing institutions, as they doesn’t advance their agendas or worldview to offer them to those who most need to hear them. By comparison, I find myself at a strange juncture in my own writing and professional life, and it happens to be one in which the value of conveying what I know to be true far outweighs any fear I might have about contradicting the party line in the discipline of creative writing. In my life as both an artist and a working professional, I find that the best thing to do when you’re at an unexpected pivot-point is to leverage it into something beneficial that can be shared—hence, the book I’ve just written. Those who’ve already started looking into graduate creative writing programs will know that they’re non-professional degrees that cannot in themselves get anyone a full-time teaching position. They will know, too, that even terminal degree-holders in the field who’ve also published a full-length poetry collection, novel, short story collection, or memoir may find it difficult to use their degree to secure full-time employment in the academy—as in fact only 1% or so of those holding terminal degrees in creative writing are able to do so. Those with some familiarity with the world of MFA and Ph.D. programs in creative writing will also know that, increasingly, those who hope to teach post-graduation are having to complete both types of degrees (the MFA and the Ph.D.) even though these two very different types of programs are officially “co-terminal.” And for those for whom the prospect of seven to ten years of residential graduate study of creative writing seems like overkill, there are—as you’ve likely heard by now—scores of low-residency programs that at present lack the cachet of their full-residency peers but can inspire, educate, and credential you in your genre(s) of choice with a minimum of disruption to your personal and professional life. The explosion in popularity of the low-residency graduate creative writing program may be the most dramatic story of curricular invention in the history of the discipline. More than half the new graduate creative writing programs founded this century have been low-residency programs; this is a startling statistic that calls into question the durability of full-residency instruction in the discipline. While scores of new full-residency programs have been founded this century—with only two closing their doors—it’s nevertheless possible that the longstanding naysayers of full-residency writing programs will finally be proven correct, and that the nationwide turn toward distance learning, “flipped” classrooms, and hybrid pedagogical models will eventually come to creative writing to the detriment of conventional workshopping. Or, given that even a terminal degree in creative writing is considered “nonprofessional” on the job market, we may see aspiring poets and prose-writers increasingly finding undergraduate, work, travel, romantic, and family experiences adequate to the task of informing their writing (alongside some rigorous, self-directed readings of contemporary in-genre work, of course). Or writers may begin to find that immersion in the theory, literature, and practice of other disciplines besides creative writing is—perhaps paradoxically—more conducive to becoming an idiosyncratic creative writer than any standardized writing pedagogy. I know I often tell my students that the best way to become successful as a creative writer is to develop an idiosyncratic personal poetics, and that the best way to develop an idiosyncratic personal poetics is to bring into your writing as many facets of your experience, knowledge, training, hobbies, and personality that seem to have nothing to do with creative writing as you possibly can. Only when our writing is a matrix of our complicated and unreplicable interrelationships with language, culture, self-identity, and genre can we be certain that what we are writing is a distinct achievement and contribution. That’s what the history of widely admired literature tells us, and what we see in practice every day in those books of poetry and prose that most capture the nation’s imagination. I’ve studied in one of the largest and one of the smallest graduate creative writing programs in the country; I’ve taught undergraduate creative writers at three public research universities and expect to shortly begin teaching low-residency graduate creative writers; and what I’ve believed in every creative writing classroom I’ve ever entered as a student, and what I’ve said in every creative writing classroom I’ve ever entered as a professor, is that a writing pedagogy is only as good as its ability to encourage deeply reflexive, idiosyncratic writing that only its author could or would produce. There are simply too many poetry collections and novels and memoirs and short stories floating about the American literary landscape for any of us to spend our precious time recreating the work others have already done. And any institution that instills in its students anything but an abiding commitment to profoundly considered, bravely wrought, imaginatively conceived, doggedly innovative writing is doing a disservice. While none of us must or even should contend with the question of posterity as we write, it is no failure of commitment to writing to ask whether we are contributing something only we could ever or would ever contribute to American letters. Indeed, I think that’s as high a calling as imaginative writing itself. The same is true, then, of writing instruction. As lifelong students of creative writing, are we maximizing our potential if we do not maximize the ways we talk about and through the writing process? In my own classrooms, students do not copyedit or nitpick one’s another’s drafts—there’s plenty of time, space, and resources to do that outside the classroom—but rather engage in open-ended, far-ranging philosophical discussions of how individual artworks, whether written by peers or by others, teach us what it is that literature can be both for us personally and a public audience. We engage complicated hypotheticals about how the works we read can be reimagined to achieve almost impossible results—say, for instance, a mystery novel with no mystery, or a children’s book written at a graduate-school level, or a cookbook informed by a virulent hatred of both food and food preparation. How can we re-orient ourselves to see everything that we are as capable of informing everything that we write? Perhaps the next great cookbook will be written by someone who doesn’t know how to cook; perhaps the next great poet is a physicist; perhaps the next great American novel will be experienced only in virtual reality. Perhaps all of us are on idiosyncratic adventures in trying to determine why writing matters to us, what we can do in and with it that no one else can, and how the way we think about the act of writing and the concept of “literature” must constantly evolve for literature to survive. I can only say of this sort of exploratory, “poetics”-oriented writing pedagogy that my students daily astound me with ideas so unique to their consciousness that they cannot help but be startling, engaging, deeply wrought contributions to the universe of what already exists. Many days I wonder whether our capacity to invent—the forms, the media, the instruments, the material, the inspirations, and the preoccupations that make up a writing practice—has so outstripped the conventional workshop that we must be careful indeed when, how, and where we expose ourselves to that rather limiting instructional method. A workshop is, in this view, only as valuable as the extent to which its participants have their eyes open to what a workshop is and is not, what it can and cannot be, what each student within it should aim to accomplish not just as a writer but as a reader of the work of others. I am reminded, often, that in the very sentence in which Ralph Waldo Emerson coined the phrase “creative writing”—in a speech at Harvard University in 1832—he also coined the phrase “creative reading.” And whatever we take that latter term to mean, it is certainly not copyediting, or holding our peers to account for the extent to which their work conforms to our self-constructed and self-constricted imaginations. All that said, funded time to write, and a flexible and dynamic and inspiring space to write in, is invaluable to any creative writer. It certainly has been to me. The eight years I spent at the Iowa Writers’ Workshop and in the Creative Writing Minor of the Literary Studies Ph.D. at University of Wisconsin-Madison were formative for me in ways both small and profound. But the learning I did at these two institutions came mostly outside the classroom: I learned from what Iowa City is and is not, and what Madison is and is not; I learned from how the Midwest is unlike my home region of New England; I learned from how I was like and unlike the poets and fiction-writers at both of the programs I attended; I learned from both the camaraderie and the strife I saw in eight consecutive creative writing program cohorts of varying sizes and demographic composition; I learned as much from watching the different ways writing can be taught as I did from any one writing instructor; I learned from the risks I took, and especially those that failed to meet my own standards; I learned from the books I stumbled across and the books recommended to me by faculty and peers; I learned from a stray comment in workshop perhaps no one else would have noticed in the way I did, just I learned from hours-long conversations in bars, cafes, movie-theater lobbies, Taco Bells, and cramped Honda Civics; I learned from people who are still closer to me than anyone but family, and I learned from people I know I’ll never speak to again and in some cases with good reason. Most of all, I learned that any person who limits your ability to bravely and in good faith fail is an enemy of your art and indeed an enemy of all art. Some of you will encounter such people in a writing program, some outside it, some in both places; certainly, I can say that today’s literary communities—institutional and non-institutional—are filled with people who intend to harm your writing practice for the sake of their own vanity, fragility, and professional self-aggrandizement. All of which is to say that choosing a graduate creative writing program is hardly a life-or-death decision, because attending a graduate creative writing program in the first instance isn’t in any sense what makes one a writer or prevents one from evolving for a lifetime within that self-identity. Even so, decisions about whether and/or where to attend a writing program are significant enough (and the chance to be inspired, encouraged, and generatively transformed by a community of artists such an unparalleled opportunity) that young poets, novelists, and memoirists owe it to themselves to capture, before they apply, all the hard data they can—as well as all the anecdotes they can, and all the conventional and unconventional wisdom they can, about writing pedagogy, writing communities, writing programs, and even creative writing as a discipline. If today’s creative writers are at once luckier and more intricately challenged than their predecessors, it should be no dissuasion from the writing life—merely an invitation to work ever harder on not just art itself but the myriad ways we talk and think about instruction and self-education in art. Seth Abramson is Assistant Professor of English at the University of New Hampshire, USA. He is a prize-winning poet and writes regularly for The Huffington Post and Indiewire. 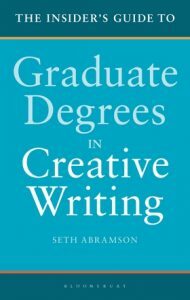 His book The Insider’s Guide to Graduate Degrees in Creative Writing is now available from Bloomsbury.